I’m happy to announce the resurrection of a printing press. I regularly help out at the National Ornamental Metal Museum’s annual Repair Days event here in Memphis. We’ve been fixing everything from finest jewelry to monumental statuary for nearly 30 years. This weekend someone brought in a very early Kelsey Excelsior 5x8 that had been poorly packaged for shipping. Unfortunately, the handle had snapped off right at the toggle pivots. We were able to braze the arms back together after a bit of fiddling. 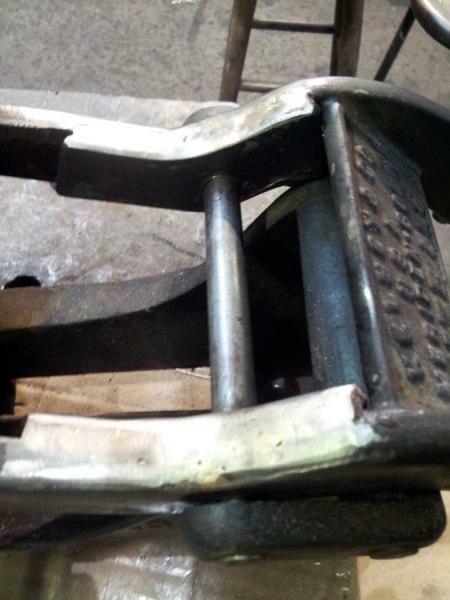 We also decided to braze in reinforcement plates on the insides of the handle arms since it’s a weak point in the structure that’s now been compromised. It’s unfortunate that the seller couldn’t be bothered to pack brittle cast iron properly, but the press is now ready for some serious refurbishment by the owner. It’s always a good day when you can bring one of these back to life! Very nice work on the repair of the Kelsey! Also, smart to reinforce that joint. A bit of grinding and tapering/smoothing down, and the press will be cranking out prints for years. It is encouraging to see something saved rather than scrapped. Great work and thanks for sharing! Michael, thanks for sending me the link to this repair. It looks super sturdy! I need to give the seller of my 6x10 an estimate of repair cost for the broken lever. Do you have a ballpark # for me? Thanks so much. at the moment you only have a proposal for a contract to cover the 150 dollars, offer but no acceptance. Or get the cost of repair deposited in an independant holding account before the work is done. This could easily get messy and end up in small claims court. The insurance by seller-delivery should have covered total cost or replacement, not repair( can a repair by guaranteed for so long? )-I’d return it at his cost, get total refund, to avoid further complications, if necessary go to small claims court if problems now. Part of the aesthetic value of a printing press is how it looks, in your case original condition, without extra bracing etc etc-press has already suffered a loss in value because of this should you wish to later sell it with a known fault, and the later potential for a repair to fail later. Thanks for this, Jonathan. After we examined the broken press further we decided to return it. The seller’s unhappy about it, but at least eBay will enable me to get a full refund to put towards another press. I don’t know how much you paid for the Kelsey or have available for purchase of a replacement, but I would suggest avoiding Kelseys in favor of the C&P Pilot and its imitators — they are much stronger and easier to operate. But my favorites are still the Golding Official and its clones — I have a Sigwalt Nonpareil that has served me well for over 40 years. Congratulations on your decision to return the press. Wise. Read carefully the advice of Bob at AdLibPress. The Kelsey in the hands of a good printer who DOES NOT wish to do smash printing, can do good work. The C & Ps and Craftsmen (also Sigwalts and Goldings) do good work in the hands of the good printer and are less likely to break. They too can be abused by trying to make them do what they were not intended to do. If you are going to stay with this craft, buy the better press. They hold their value. Jonathan, that site is just amazing! And Bob, a C&P Pilot is my aspirational press, assuming I can get good at working the Adana I just purchased. Lettepress is definitely not an inexpensive hobby….! So….it turns out that I am the owner of this broken Kelsey as the seller can’t pay for my return of the press and eBay is refunding all my money. How do I ascertain if it’s worth repairing? In addition to the broken lever, there’s a repaired crack along where the ink table is inserted and the press will need a new chase. Would anyone want it for parts? Since you’re getting a refund you might have enough money to make repairs and use the press even if it isn’t authentically 100% Kelsey. You could probably get a welder-machinist to make a copy of the handle in steel — it’s a pretty simple piece — and the same person could make you a welded steel chase that would work fine. You could then use that press while you search for a satisfactory replacement or addition to your collection. :-) T&T might be able to help with all of that. Melinda, sorry to take so long getting back to you. I didn’t realize this thread had moved over here and was looking back at your original post! I’m afraid I don’t really know what the repair to this press cost. I’m just a shop monkey at Repair Days. I don’t do any of the money handling. And beyond that, all the craftspeople donate their time and skills so that all funds go directly to the Museum. This means many repairs have a better price at the event than they would otherwise. Where are you located? That could have a big impact on how much the repair is likely to cost.